This is one of the good bedtime stories for kids to read. Once upon a time in a far-off land, there lived a huge giant. He made his home in a big cave high up in the mountains. His bed, table, and chairs were made from great tree trunks. And when he wanted to drink, he simply filled an old bath tub with water and drank it down in an enormous gulp. When he snored, which he did almost every night, it sounded like a huge thunderstorm and the noise echoed all around the mountains. At the bottom of the mountains, there was a village but all the folk in the village were different from the giant for they were not big at all. They were just like you and me. They were afraid of the giant. Also, read The Selfish Giant Story. Image Source@ jaced.com. Whenever the giant came striding down the mountains to hunt, the villagers ran away into the woods or locked themselves inside their houses. 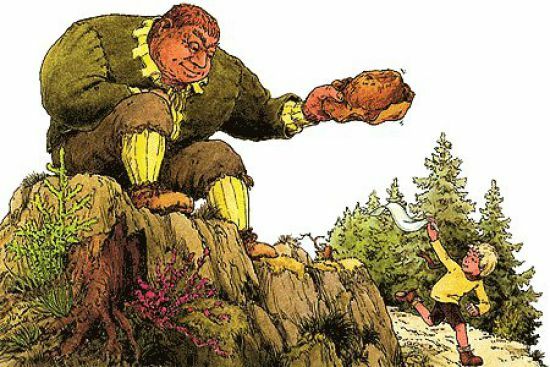 Sometimes, the clumsy giant would tramp around the village squashing houses with his great feet as he went and that only made the village folk even more frightened of him! Although the giant was big and strong, he was not a bad giant. He was very lonely because everyone ran away whenever he appeared. Sometimes, while he was sitting alone in his cave, he could hear the villagers having feast and parties. He always longed to join them and be just like them. One day, when the giant was tramping around the village, as usual, something glinting in the sun caught his eye. At the top of the big tree lay a gold box. The giant bent down and picked up the box. To his surprise, he heard a small voice inside say, “Help! Let me out!” The giant opened the box and out jumped an elf. “Thank you, Large Sir!” he said. “I’m a magic elf but one of my spells went wrong and I got locked inside this box. No one in the village could hear me calling for help high up in this tree.” Also, read The Laughing Princess. To show his thanks, the elf said he would grant the giant one wish. “I wish I could be the same as all the other villagers,” boomed the giant. “What a difficult wish,” said the elf. “You are so big! But I will do my best!” The elf closed his eyes and chanted a magic spell. But nothing seemed to happen. The giant was still as big as ever. The giant was very sad to discover that he had not shrunk but he wished the elf well, thanked him for trying and went on his way. As the giant was walking back to his cave in the mountains, he noticed something strange. All the puddles of water that he had passed on the way down to the village had got bigger. They were as big as lakes now! The giant looked up to see if it had been raining but the sky was clear and blue. Suddenly, the truth came to him. Everything had not become bigger, he had become smaller. The spell had worked after all! Now he was just the same as the other folk in the village. He made his way to the village wondering if everyone would still run away as before. But he need not have to be worried. All the villagers welcomed him into the village and he lived there happily among them for the rest of his days. Also, read The Brave Little Tailor Story.